The Andromeda Collection is our first Earth Jewellery range with strong galactic energy and divine light channelled to serve the highest good for humanity. This collection has been 3 years in the making with the first channelled messages and light frequency for our ‘Light Pyramids’ received in early 2014. 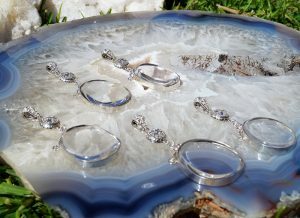 Since then we’ve been bringing through higher galactic frequencies to ensure this crystal jewellery was ready to up level the frequency of our planet and the collective was ready to receive it. It is our great pleasure to launch the first handcrafted, high frequency ‘Light Pyramids’ from our Andromeda Collection. We know you’ll love your ‘Light Pyramid’ and the beautiful energy transmitted to serve your highest good and purpose. Each ‘Light Pyramid’ comes with a unique channelled message, that will be channelled prior to dispatch of your purchase and included with your art jewellery.